Lots of people ask about dating watches so I thought it might be a good idea to share our collective information. I'll start the ball rolling with dating Omegas. 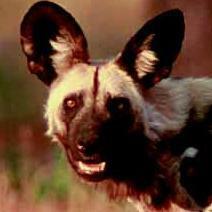 Essentially all Omegas are dated by their movement number, obviously you'll need access the movement to find this. Once that's done here's a list of movement numbers with corresponding years, I hope this is legible. Although this is a good system and extremely useful it's not infallible or 100% accurate. Lots of Omegas are put togethers or frankenwatches especially the more iconic models. For example a vintage SM300 may well have a cal.565 from a much less valuable model like a Geneve. If your movement has a R next to the number it means it's a service replacement movement (thanks to JonW for that snippet of info). Hope this helps and if anyone want to share dating information from other manufacturers please add to this post. I've got a scan of a German Tissot dating sheet somewhere, if I can find it I'll translate, type it out and post later. P.S. Mods do you think this might be worth pinning? Hopefully it'll grow into a useful resource for many. Most Seikos have a 6 digit number on the case back. The first number represents the year and the second the month of manufacture. Here's my my 6138-8039 by way of an example. So this one dates from September 1976. Obviously you need to have an idea of the decade the watch was produced. If you're uncertain about this there's also a dating calendar on the link below. Next up Tissot. Found my scan and typed this lot in, so a labour of love. 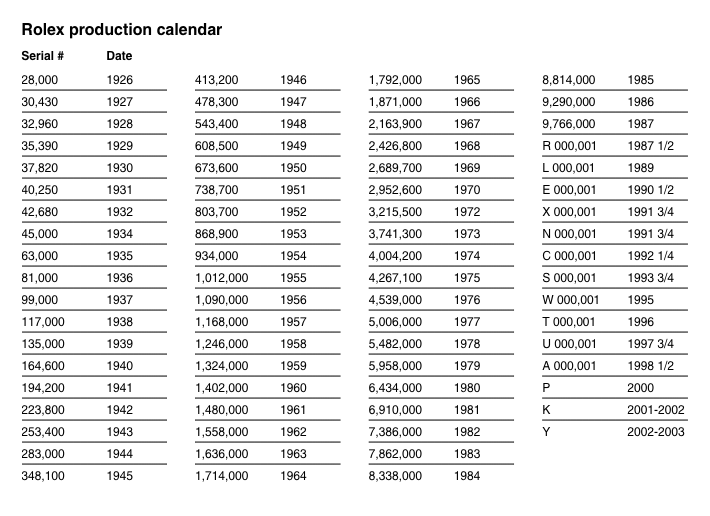 Tissots are dated by the movement numbers like Omegas, here's a list of numbers with there corresponding year(s). I do suffer from mild dyslexia so I'm not guaranteeing the accuracy of this chart. 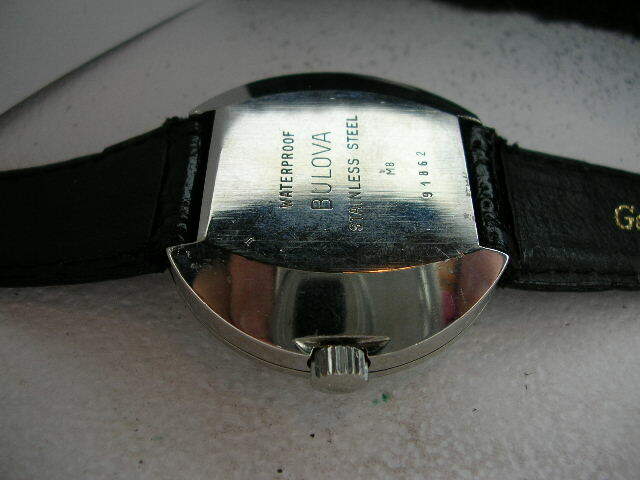 In the 1950's Bulova incorporated a letter and number system to date the watches they manufactured, these are stamped on the outside of the case back. The code is very simple, the letter represents the decade L=50, M=60, N=70, P=80, T=90 and the number is the year. Rolexs are dated by a serial number which is found between the lugs, at the bottom of the case (6 o-clock). The serial number denotes the actual manufacture date. Date of market introduction may vary, expect to add 6 to 18 months. Here's a list of their oyster model serial numbers and corresponding years. Early Timex UK Dundee markings. Don't ask about the logic, nobody seems to know :D The letter is believed to indicate either the month of manufacture, or the production line, again no one seems to know for sure. From 1967 onwards dating can be done using the numbers on the dial at the six -o'clock marker. Numbers to the left of the marker indicate model of watch, those to the right of the marker are normally the movement number and year of manufacture. Assume an eight figure number, first four are 2014, this is the catalogue (model) number, and to the right, 2468 indicating a #24 movement, and year of manufacture as 1968. 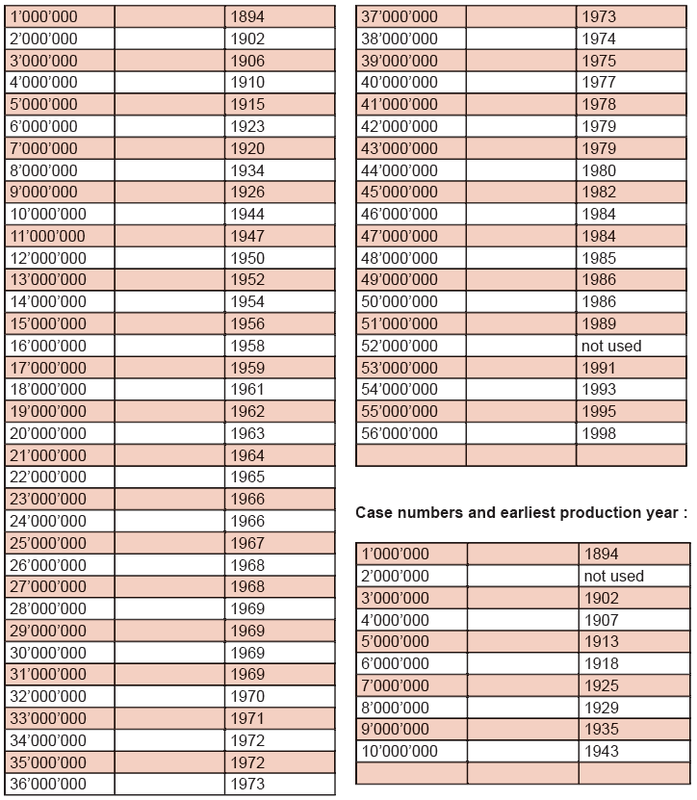 As far as is known, longer than eight figure numbers follow this pattern, but always with the last two indicating year of manufacture. Timex sub-brands also using some or all of this system include Kelton, Saga and various unbranded character watches. Thanks Phil and Mel :) . 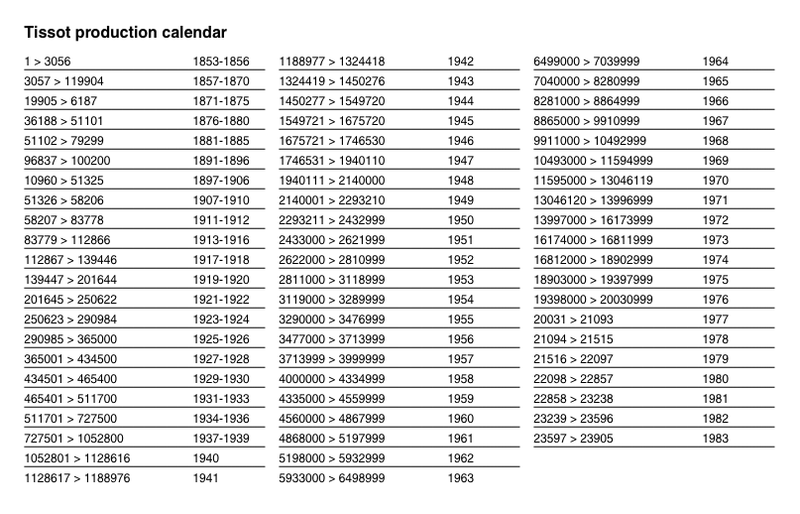 Here's the year and corresponding serial numbers for Tudor. If anyone else has other manufacturer production calendars or means of dating watches please feel free to contribute. In the meantime I'll do some digging on the interweb and see what I can find. This needs pinning to the top of the forum. "Services"- mid 1920s to late 1930s. 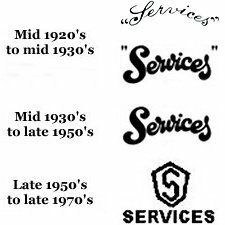 SERVICES (above an S inside a shield)- late 1950s until the company ceased selling watches sometime in the late 1970s/early 80`s. ever heard of a "dreadnought" watch dated 1921 in 9ct gold? I'm currently trying to find out more about vintage Longines and stumbled across this. I don't own a Longines (got something incoming though ) so can't vouch for its accuracy. Edited June 6, 2010 by sam. As I said I know nothing about Rolex so I'll hopefully learn from those who are far more knowledgeable. Rolex have used the same numbers twice. "I'll hopefully learn from those who are far more knowledgeable." Edited June 10, 2010 by sam.